Instructions for Guests Morning check-in will be located in the Community Life Center (CLC) Lobby on level 1. Guests who are unable to check-in between 8-9 a.m. may visit the Hospitality Center, in The Underground, to collect their materials. Registration Online registration is now closed. Please contact the Office of Alumni and Family Relations at parents@bethel.edu or 651.638.6462. There's a special connection between a grandparent and a grandchild, no matter their ages. Bethel University's 7th annual Grandparents Day is an opportunity for Bethel students and their grandparents to celebrate that special connection and enjoy a day together on Bethel's campus. 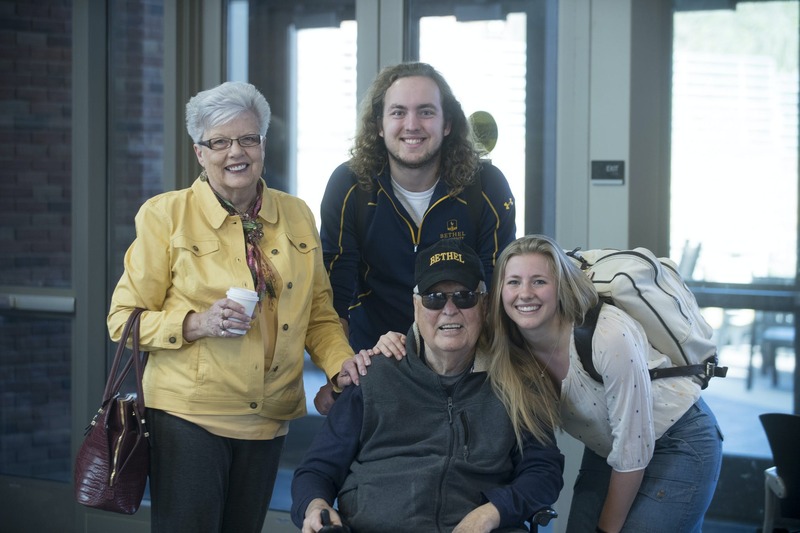 Grandparents, you will have the opportunity to attend chapel, tour campus, hear from university leaders, eat lunch in Bethel's beautiful Monson Dining Center, and have a wonderful time engaging with your grandchild as you experience their home away from home. "I enjoyed seeing and visiting with our grandchildren, of course, but we did benefit and enjoy the session. Our grandson wanted to be sure we went to that and we were very happy we did!" "Seeing how my granddaughter, a junior, has grown and matured so much in her three years at Bethel was a joy. To see her greeting other students by name and the obvious strong friendships just melted my heart! I am so thankful for her positive experience and Christian journey at Bethel!" Check-in and receive your Grandparents Day materials then mingle with other grandparents and enjoy some coffee and pastries before the opening session. Guests who are unable to check-in during this time may visit the Hospitality Center, in The Underground, to collect their materials. Gather with other grandparents in Benson Great Hall to hear from President Jay Barnes and other members of the Bethel community. Students are also welcome to attend this session as their schedules allow. Attend chapel with your Bethel student and hear from guest speaker Dr. Raleigh Washington. Dr. Washington is the founder and Pastor Emeritus of Rock of our Salvation Evangelical Free Church in Chicago, Illinois. He co-authored Breaking Down Walls: A Model of Reconciliation in an Age of Racial Strife with Glen Kehrein, the 1994 Gold Medallion winner from the Christian Booksellers Association. Raleigh also attained the rank of Lieutenant Colonel in the U.S. Army, earning the Bronze Star for meritorious service in Vietnam. He entered Trinity Evangelical Divinity School in 1980, where he earned his Master of Divinity. Dr. Washington was also awarded Doctor of Peacemaking by Westminster College, making him the third recipient of the award; the first went to Mother Teresa and the second went to Bishop Desmond Tutu. Experience lunch on campus with your grandchild (as their schedule allows) and enjoy the variety and appeal of Bethel's buffet-style dining. Your Grandparents Day registration includes a ticket for lunch. Students may use their meal plan or flex dollars. If your student doesn't have a meal plan or flex, they may purchase lunch at the entrance to the Monson Dining Center for the special Grandparents Day rate of $8.75. Looking for a place to spend some time connecting with your grandchild or to unwind while they're in class? Visit the Grandparents Day Hospitality Center, where you can enjoy refreshments, read the newspaper, get to know other grandparents, or simply relax. Also, be sure to stop by the photo booth with your grandchild to take a selfie as a memento from your time spent together! There is something at the core of Bethel that makes us different, that changes outcomes, that shapes students and helps define who they become. Find out what that is by hearing from our Chief Marketing Officer Michael Vedders. One of the biggest public health threats today is antibiotic resistance. Antibiotic-resistant bacteria are severely limiting our treatment of infectious diseases, especially in those with compromised immune states or suffering from healthcare-associated infections. What is antibiotic resistance, what causes it, who are the major culprits, and can we stop them? Join Dr. Brittany Nairn, Assistant Professor of Biological Sciences, to find out! Have you ever wondered what it's like to participate in athletics at a Christian university like Bethel? Why do our coaches coach at Bethel? What are their goals for their teams? How do they go about achieving these goals? What do they hope to develop in their student-athletes over their years with them? Come hear from some of our head coaches as they answer these very questions. Join student hosts from Bethel's Office of Admissions for a one-hour indoor walking tour of campus. The tour will depart from the Admissions Guest Center. European buckthorn is a non-native shrub that has invaded Bethel's woods, choking out native seedlings. Faculty, students, and maintenance staff have worked to manually remove buckthorn, but we have had limited success in controlling the buckthorn populations. Last summer, Bethel experimented with goat grazing to combat the buckthorn. Come to this mini-lecture to hear from Dr. Amy Dykstra, Associate Professor of Biological Sciences, to find out about the project and what was learned. Be sure to check out all the great merchandise at the Campus Store (next to the Grandparents Day Hospitality Center). You'll receive a special Grandparents Day 20% discount so you can show your Bethel pride! The Office of Student Life has extended visiting hours for residence halls. Accompany your grandchild and experience his/her living community. Looking for a place to stay during your visit? Bethel has worked with a number of area hotels to secure good rates for our campus guests. View a list of hotels and request their Bethel rate when you call for reservations. Contact the Office of Alumni and Family Relations at parents@bethel.edu or 651.638.6462.